THERE’S SATISFACTION in buying a book for one reason, then coming to enjoy it for other reasons entirely. So it is with A Field Guide to the English Clergy, by the Revd Fergus Butler-Gallie, MA (Oxon), BA (Cantab), Clerk in Holy Orders. 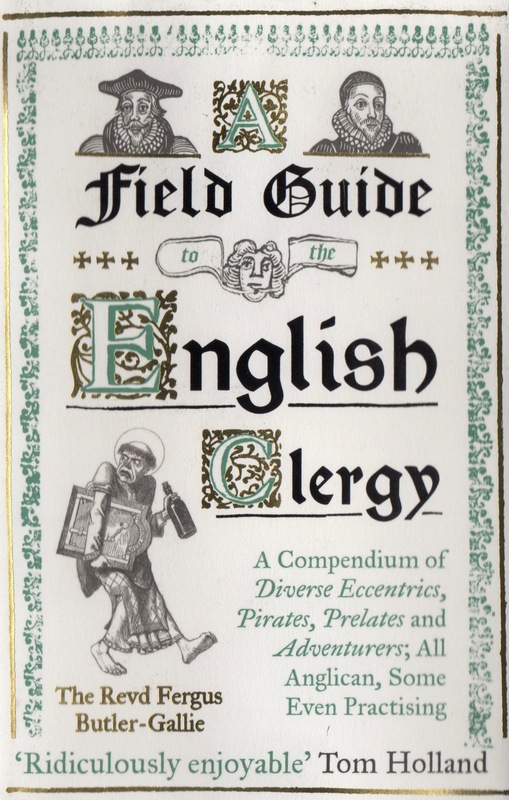 A Field Guide to the English Clergy: A Compendium of Diverse Eccentrics, Pirates, Prelates and Adventurers; All Anglican, Some Even Practising by the Revd Fergus Butler-Gallie, Oneworld Publications, 2018. Indeed, I bought the book for precisely this sort of ecclesiastical gossip. But along the way, I also learned about another English prelate who had lunar real estate named in his honor. The following tidbits are gleaned from Butler-Gallie’s book and my usual Internet sleuthing. The rogue gets his bio today in Part 1; we save the scientist for the following Parts 2 and 3. Butler-Gallie calls the Reverend Dr. Edward Drax Free, 1764–1843, Rector of All Saints, Sutton, “probably the most troublesome clergyman in the history of the Church of England.” High praise indeed. A contemporary illustration of the Reverend Edward Drax Free and friends. Image from alchetron.com. Upon arriving in 1808 at the Church of All Saints, Sutton, Bedfordshire, Drax Free promptly got the housekeeper with child. Other housekeepers met a similar fate; Drax Free was the father of at least five illegitimate children. 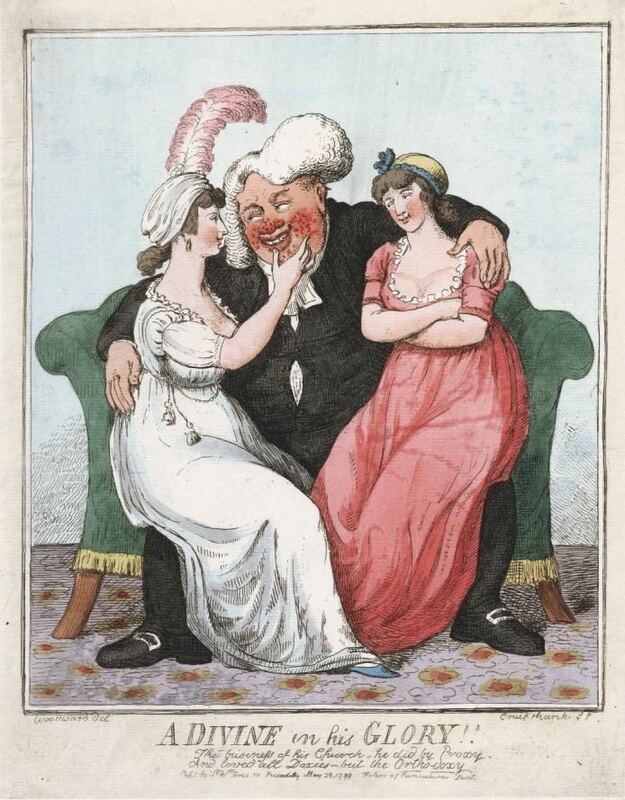 Scandal in the Church: Dr. Edward Drax Free, 1764-1843, by R.B. Outhwaite, Hambledon & London, 2003. For a review of this book, see Project Muse. At one point, the reverend covered his gambling debts by selling lead from the church roof to a scrap metal merchant. His downfall came after he sued a parishioner for non-attendance, despite the church being roofless and almost permanently closed. The suit had an historic tie to an obscure law passed by Queen Elizabeth I more than two hundred years earlier. Mr. Simanaitis, I have been a fan of your writing since I first read you in Road & Track. Thank you for enlightening and delight(en)ing us. Ken. 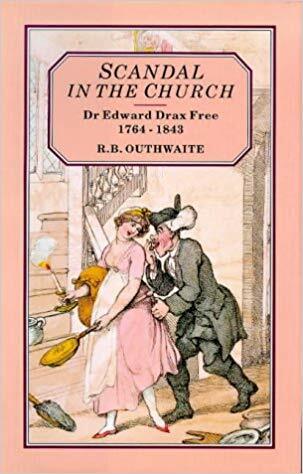 This entry was posted on February 5, 2019 by simanaitissays in And Furthermore... and tagged "A Field Guide to the English Clergy" Revd Fergus Butler-Gallie, "Scandal in the Church: Dr. Edward Drax Free 1764–1843" R.B. Outhwaite, Bishop's men set siege to rectory, rector sells lead off church roof for gambling debts, rector sues parishioner for non-attendance.